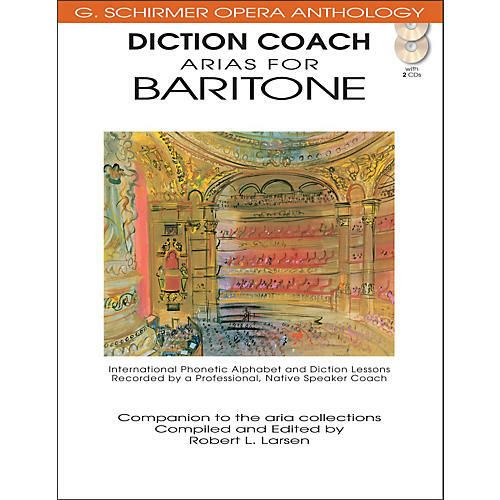 Diction lessons on each aria in the series recorded by top language coaches from the Metropolitan Opera and the Juilliard School plus International Phonetic Alphabet and word for word translations With these book/CD packages that match the standard aria collections edited by Robert L. Larsen, any singer anywhere has access to the best diction coaching available at a very affordable price. Each aria is recorded twice. In the first version the coach recites the text as an actor would speak it, showing flow of the language and the mood. The second version is a slow, deliberate lesson, allowing time for the student to repeat each line. These experienced language coaches adapt the R in German and French in the slow versions for singers. They also are very sensitive to liaisons between word sounds in the musical settings. The book includes International Phonetic Alphabet for each aria and word for word translations. The native speaking professional diction coaches from the Metropolitan Opera and the Juilliard School are: Corradina Caporello for Italian, Pierre Vallet for French, Irene Spiegelman for German, Kathryn LaBouff for English, Yveta Synek Graff for Czech, and Gina Levinson for Russian. Companion to 50481100 Arias for Baritone.